Join mission control at NASA’s Jet Propulsion Laboratory as signals return from the InSight mission as it lands on Mars. Landing commentary includes interviews with team members. Prior to landing, the surface operations team will practice setting down the instruments. They’ll use a working replica of InSight in an indoor “Mars sandbox,” which will be sculpted to match the mission’s actual landing site on Mars. The team will check to make sure the instruments can be deployed safely, even if there are rocks nearby or InSight lands at an angle. Engineers at NASA’s Jet Propulsion Laboratory in Pasadena, California, which leads the mission, are preparing for the spacecraft to enter the Martian atmosphere, descend with a parachute and retrorockets, and touch down today at around noon PST (3 p.m. EST). InSight — which stands for Interior Exploration using Seismic Investigations, Geodesy and Heat Transport — will be the first mission to study the deep interior of Mars. Before InSight enters the Martian atmosphere, there are a few final preparations to make. 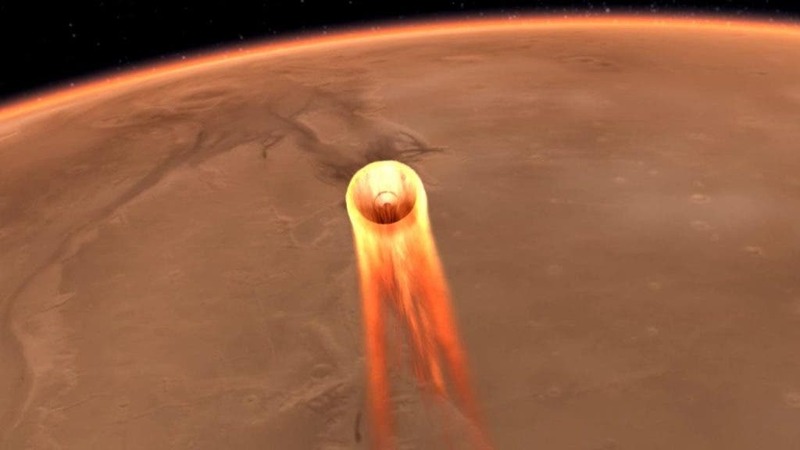 At 1:47 p.m. Sunday PST (4:47 p.m. EST) engineers successfully conducted a last trajectory correction maneuver to steer the spacecraft within a few kilometers of its targeted entry point over Mars. Engineers still need to conduct a last trajectory correction maneuver to steer the spacecraft toward its entry point over Mars. About two hours before hitting the atmosphere, the entry, descent and landing (EDL) team might also upload some final tweaks to the algorithm that guides the spacecraft safely to the surface. These will be the last commands issued to InSight before it robotically guides itself the rest of the way. The EDL team worked for months beforehand to pre-program every stage of InSight’s landing, making adjustments based on weather reports from NASA’s Mars Reconnaissance Orbiter. Engineers will be huddled with scientists at JPL today, Nov. 26, watching with nervous anticipation for signals that InSight successfully touched down. Once the final position of each instrument is decided, it will take several weeks to carefully lift each one and calibrate their measurements. Then the science really gets underway.